Life as a student is good for Flynn. As one of the top pianists at the Royal College of Music, he has been put forward for an important concert, the opportunity of a lifetime.But beneath the surface, things are changing. On a good day he feels full of energy and life, but on a bad day being alive is worse than being dead. Sometimes he wants to compose and practise all night, at other times he can't get out of bed. His flatmate Harry tries to understand but is increasingly confused by Flynn's erratic mood swings. His friend Jennah tries to help, but Flynn finds it difficult to be around her as he struggles to control his feelings and behaviour. With the pressure of the forthcoming concert and the growing concern of his family and friends, emotions come to a head. Sometimes things can only get worse before they get better. "An exhilarating, emotive and at times exhausting read, which I couldn't put down"
Tabitha Suzuma was born in 1975 and lives in London. She has always loved writing and would regularly get into trouble at the French Lycee for writing stories instead of listening in class. She used to work as a primary school teacher and now divides her time between writing and tutoring. 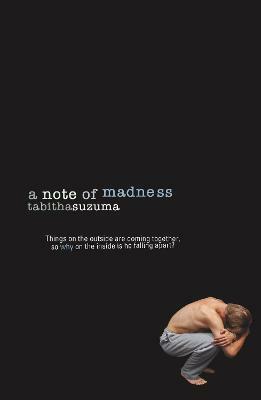 A Note of Madness is her first novel.